After a year off following a bit of a critical slump, Pixar is back with “Inside Out,” as original a concept as it’s had in a while. The film is sweet and funny and brimming with creativity. That creativity is its greatest strength and its greatest weakness. The film follows the adventures of the personified (well, converted to some kind of beings anyway) emotions inside the head of an 11-year-old girl named Riley (Kaitlyn Dias). Their leader is Joy (Amy Poehler), who feels constantly threatened by Sadness (Phyllis Smith). Also in a prominent position are Fear (Bill Hader), Anger (Lewis Black), and Disgust (Mindy Kaling). The five of them operate a control panel in Riley’s head in relative harmony, though Joy is a bit dominating and lately Sadness has been getting a little grabby with both the panel and happy memories, which she can turn sad just by touching. Things are shaken up when Riley and her parents (Diane Lane and Kyle McLaughlin) move from Minnesota to San Francisco. Riley has to start a new school, leave her friends behind, accept that ice hockey isn’t typical in her new environment, etc. Joy tries to lead as usual and put a positive spin on everything, but Sadness keeps interfering. Eventually she interferes with Riley’s “core memories,” the really important ones that shape her entire personality. A fight over a core memory leads to both Joy and Sadness being sucked out of “headquarters” and into the labyrinth of Riley’s long-term memories. Joy and Sadness adventure back not only through Riley’s long-term memory, but her entire subconscious. They meet up with a long-dormant imaginary friend (Richard Kind); shake things up in Dream Production Studios, face Riley’s greatest fears, brave a canyon of forgotten memories, and learn why a chewing gum jingle keeps getting stuck in her head. Along the way they learn that while it might not be preferable, Sadness does play an important part in one’s development, though I still don’t see why she has to taint already-happy memories. The film’s humor is just about perfect. The emotions are simultaneously super-logical and super-touchy, and it’s interesting to see their take on such situations as eating broccoli, taking a long car trip, and going to new school for the first time. Plus we get some movie-stealing looks inside the heads of minor characters, all of whom have similar lineups of emotion-beings. There are sad moments too, such as when happy memories fade away forever, and conflict between the suddenly-irritable Riley and her loving parents. The movie does laughs and tears very well. It’s on the logistical front where I see cracks in this movie. I know it seems silly to complain about logistics in a clearly made-up world like this, but these characters are definitely playing by some sort of rules, and the movie needs to do a better job of explaining what those rules are. For example, the “islands” linked to Riley’s core memories fall into an abyss one by one. What happens if they all go away? Will they eventually be replaced by new islands? Does Riley go catatonic? We don’t know what’s on the line here. I also had a problem with a few scenes of daring escapes. Some of the ideas that the characters cook up feel like cheating because we had no idea they were an option. To be sure, there a lot to like about “Inside Out.” It does a lot right, from the chemistry between the characters to the gags to its many creative concepts, though sometimes that creativity gets out of hand. Maybe the filmmakers could have used some Sadness-like discipline to flesh out some of their Joy-ful inventive ideas. Maybe I’m overthinking things and not allowing the film to be exactly as silly as it wants to be. By all means see it for yourself and feel free to tell me I’m wrong. 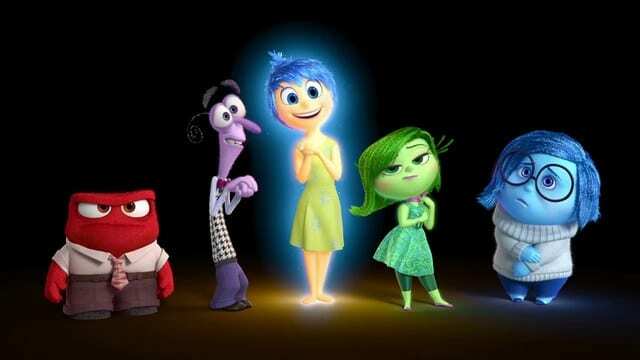 “Inside Out” is rated PG for mild thematic elements and some action. Its running time is 94 minutes.